MGC University, Bihar gets 10 percent land: Happy! 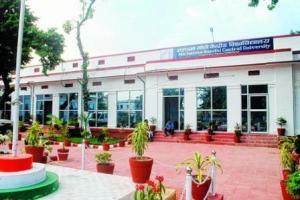 Motihari (Bihar): Mahatma Gandhi Central University of Bihar, now running out of a makeshift campus located on the premises of Zila school is set to get 33 acres for its ‘permanent campus’. It is only about 10 percent of what is needed. According to the original plan, the university is to be given 302 acres just outside Motihari town. The East Champaran district magistrate sent in a letter has requested the education department to take possession of the land. This is good news for the university, which started in 2016. “We are aware of the development and hope to get the land soon. The university vice-chancellor, Arvind Agarwal, told a local newspaper expressing his happiness over the development. The university is offering just 15 undergraduate and postgraduate courses and about 550 students are enrolled on its Zila School campus.. The vice-chancellor said as soon as the land is handed to the university, selection of an agency to undertake construction work will start. The university plans to build classrooms, library, staff room and administrative blocky so that academic activities could start from the permanent campus at the earliest. Agarwal wishes to use pre-fabricated structures on the campus because the work needs to be completed in the shortest possible time. “We intend to shift the academic work to the permanent campus by December this year,” he said. In the first phase, the district administration will acquire 136.4 acres of which the acquisition process of 33.47 acres is complete, while the process is on for the remaining chunk.